Wearing pretty clothes is what we all want. But, sometimes maintaining those pretty outfits is a challenge. A tear, a mishap, an unraveled accessory are disappointing. I have always struggled to keep my beloved outfits in top shape – because fallen buttons is woe that I never manage to rid of! Plus, many times, a defective zipper or a broken button, hook et al messes up the whole dress, at times to the point where the dress becomes un-wearable - till fixed. How to fix this in a jiffy? Running to tailors is just not practical all the time! This was an issue, till I learnt to deal with when I realized how much fun mending outfits at home could be. Surprised? Don’t be. Issues that require simple needle-work - like putting on a button/hook, or sewing an unraveled hem – are easy and absolutely doable quickly. Let’s begin with learning how to attach a button. 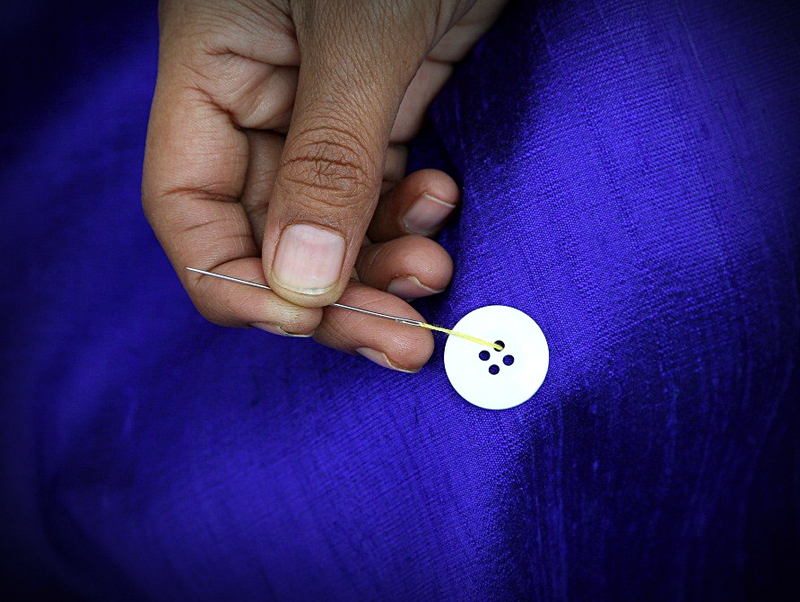 Decorate your new dresses or kurtas with fancy buttons or mend the fallen ones. 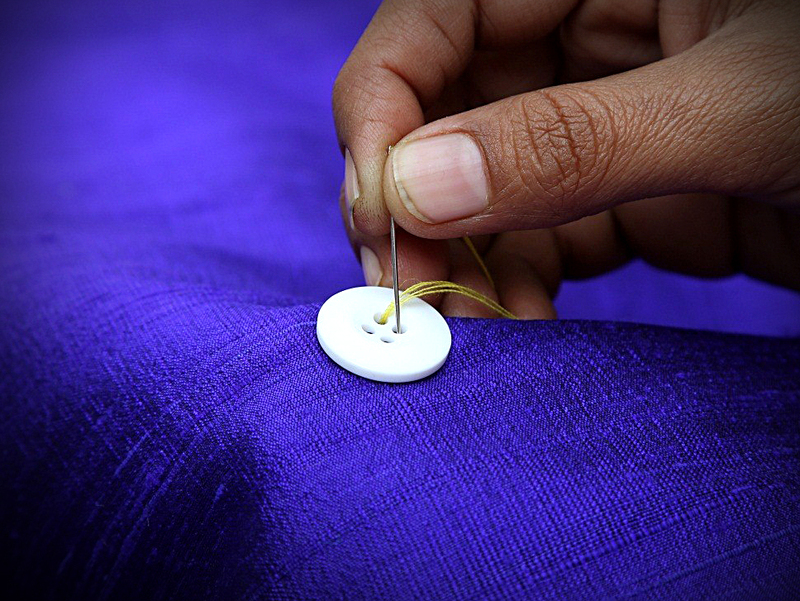 This will work perfectly, when you study/ work away from home, and don’t have your mum’s help at hand  Shirts, Indian suits, trousers, blouses, lehengas, skirts – everything with a button can be decorated or mended using this simple act of needle-work. 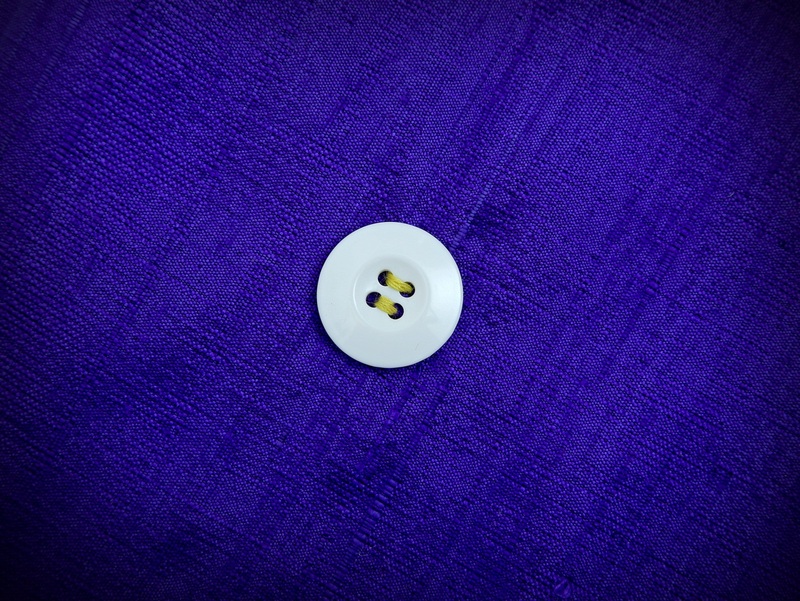 Sewing a button is absolutely simple, but it’s astounding that still how many people just don’t know how to do this. At saree.com, we care about you, and wish to make your lives easier and ways more resourceful. So, here’s a step by step guide (with pictures) to teach you the process of attaching a button. You just need to have a few things ready, before you start sewing. Spread the garment or fabric neatly on a table/flat surface. 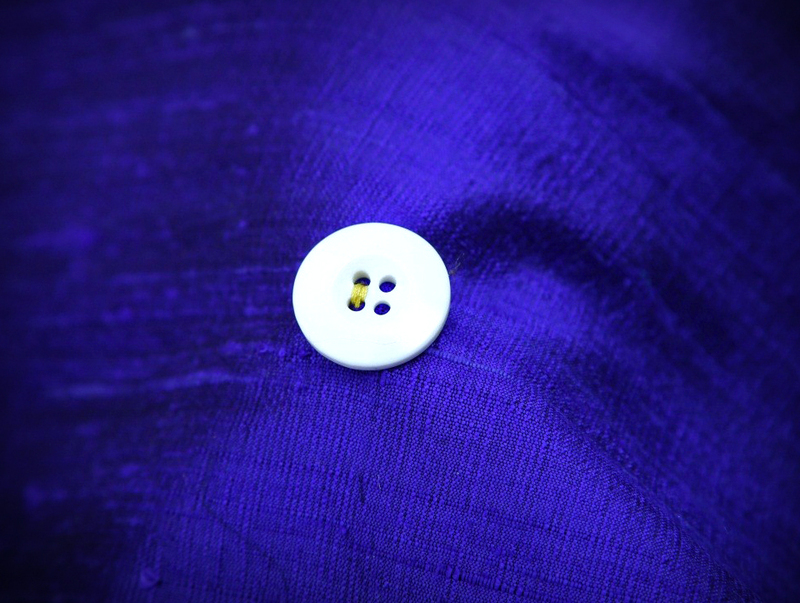 If re-placing the button – look at the traces of it on the dress. If attaching new ones, mark places where you want to attach the button/s with the chalk. NOTE: Chalk markings, in case noticeable, can be removed easily with a little water sponging, after the sewing is done. 1. 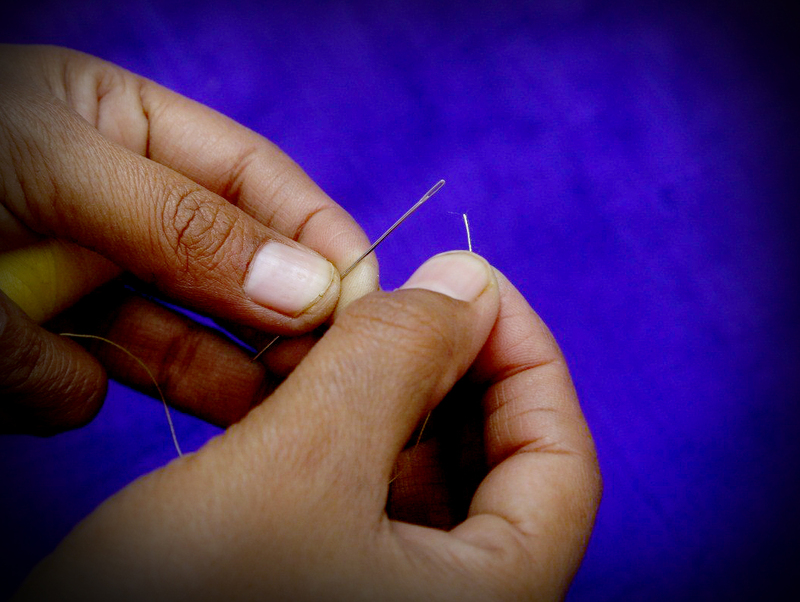 Thread – You may choose to sew with a single yarn of thread or choose the double for heavier buttons. 13 inches of thread should be enough to sew one button. 26 inches, if you want to use double yarn. 2. To start, pass the smoothened edge of single yarn (of the matching thread), through the little eye on the sewing needle. This requires precision, and may not be easy in case of thin, sharp needles – at first. But, don’t worry, you will become better at this – with practice. 3. For single yarn stitching - One thread yarn will be longer than the other one. The longer thread will act as a base to work with. For double yarn stitching – Both the yarns will be equal in length. Tie them together, making a knot at the end. 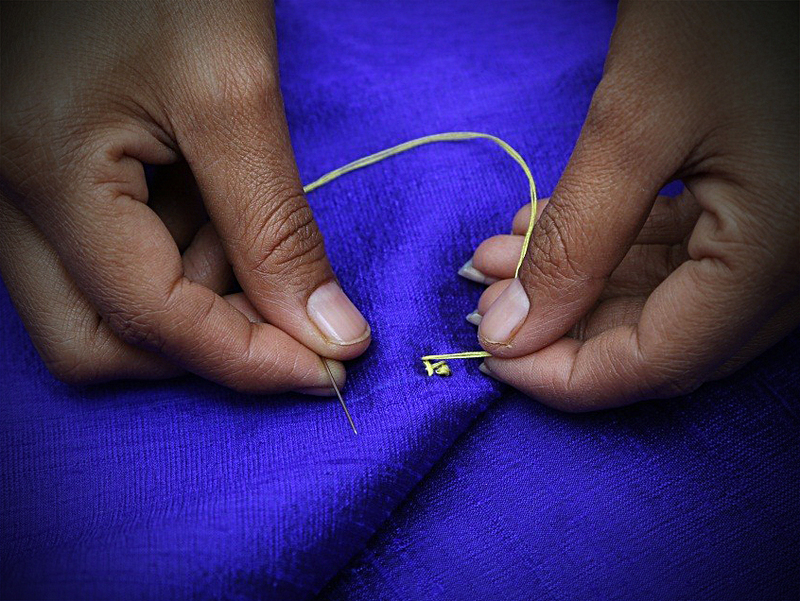 Place the button on your saree blouse or fabric, where it has to be stitched. Note how many holes the button has. Flat ones generally have 4 holes. Some fancy ones have 2, while heavy, ornate ones have one hole at their back side. 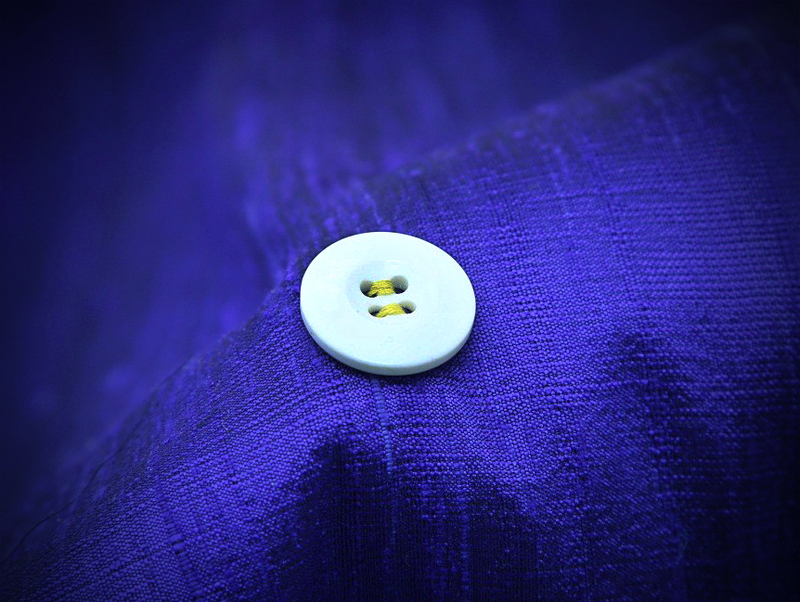 Whatever the button type - the process for attaching it is almost similar. Start working from the wrong side of the fabric. 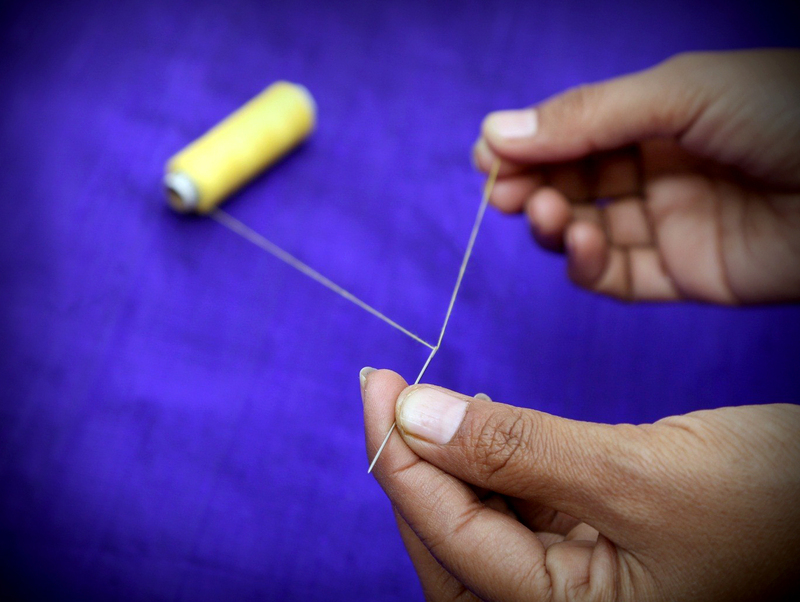 Pass the needle and thread through the fabric, such that you bring the needle up on the right side of fabric – passing it through the button hole. 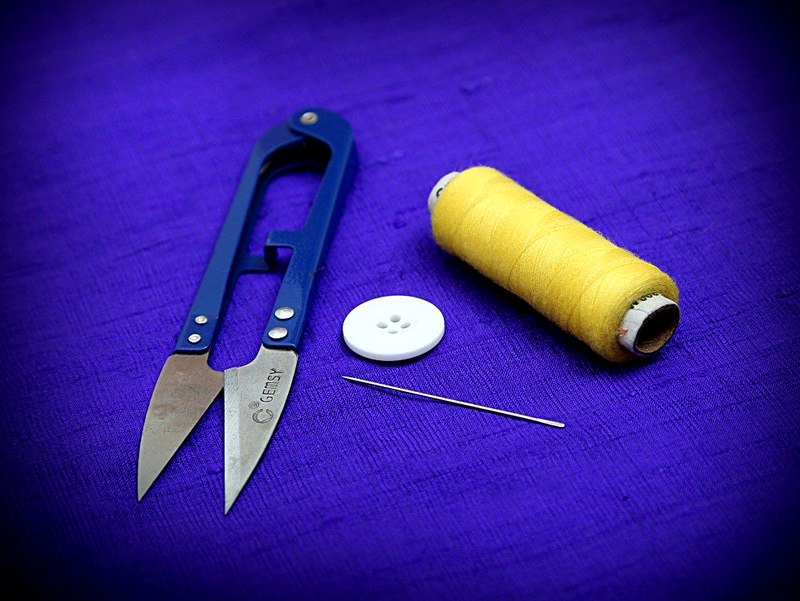 You will note that the thread has already secured a part of your button to the garment/ fabric. Follow this same process a few times, so the button and thread are secured strongly. Continue the same thread to cover the other 2 holes (if the button has four holes). Bring the needle up from 3rd hole after the first round of sewing and take it down through the 4th one. Repeat. 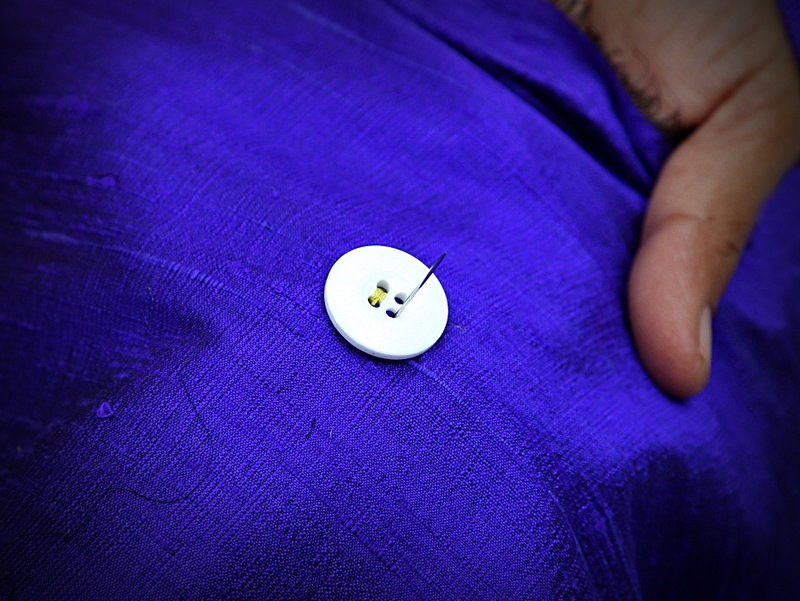 Now, you shall have your button neatly stitched onto your garment. It’s time to conclude by tying a knot at the back (wrong) side of the garment – so it doesn’t show. Flip the garment to the wrong side. You shall have nearly 5 inches of thread left, which is enough to tie a knot. 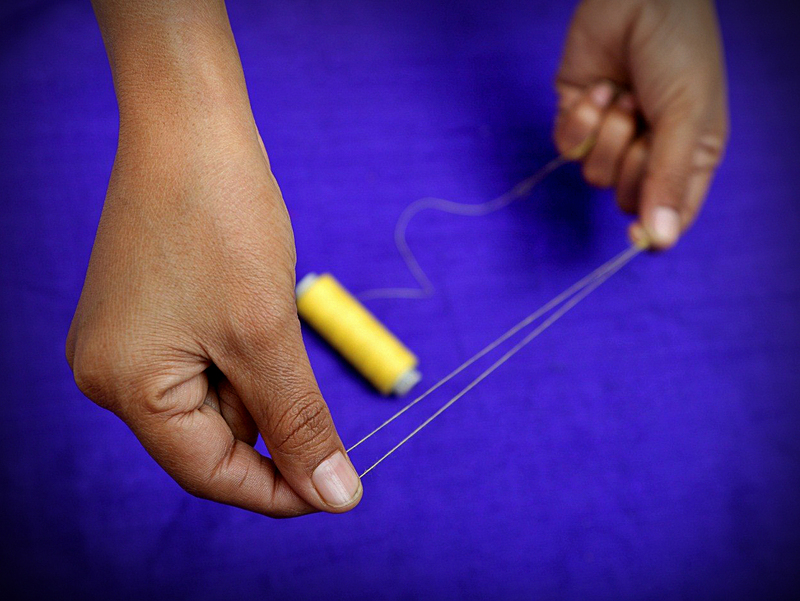 Make a thread loop with the extra yarn, and pass the needle through the loop. Pull gently till the knot is formed at the end and the sewing is secured. Take 2-3 stitches on the back side - to further secure this. Simple? See, we told you! You have mastered a seemingly simple but extremely important life skill.